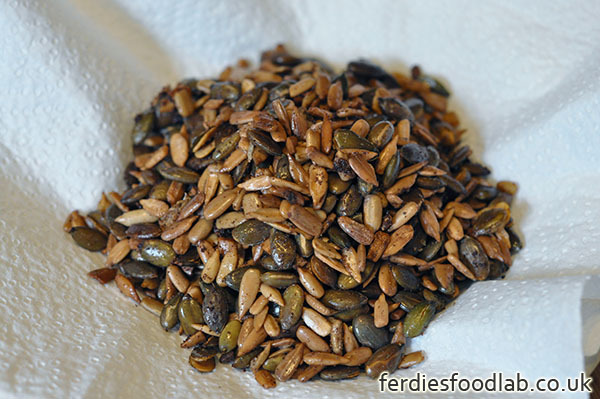 When ever a recipe calls for toasted pine nuts or pumpkin seeds (like pearl barley) I always used pop them into a pan with a touch of oil and try and keep them on the move. Invariably they’d be close to black in places when I was done, often from leaving them for just a second too long. Really annoying!! Pine nuts aren’t cheap either so burning them can be a costly! A much better way to do them is to add a large knob of butter in with the nuts you’re toasting. It melts and bubbles around the nuts distributing the heat more evenly and giving you an evenly golden toasted nut, with the added benefit of the fabulous flavour of butter! If you store them in an air tight box they’ll stay crunchy and golden for a month no problem. I do them in large batches to save messing about all the time . . . kind of nice to snack on too, although I wouldn’t advise having too many or too often! Melt the butter in a sauce pan on a medium high heat and add half of the seeds as soon as it’s melted. Once they’re light golden remove them with a slotted spoon and add the rest of the seeds, and repeat. Put them on a paper towel to drain. You can make these well in advance, store them in an airtight container and use them as needed. Pay close attention, once they start to turn they turn quickly! Keep them moving and take them out early if you’re not sure.